March madness is fully underway and this week again we check out a school that has some aspirations this year in the tourney. We also have the added benefit the mascot and school being more topical because of the news they created in college football for that last couple of months. That’s right, this week we are all about the University of Utah’s Swoop! There’s not much to chew on history wise, so we’ll write some up as we look at this fresh young entry into mascot-dom and maybe learn a little something about being big time. The University of Utah had the dubious distinction of being the only team in the Mountain West Conference to not have a mascot. The school name of Utes came from the Indian tribe in the area. 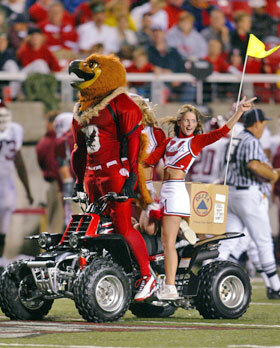 The University of Utah received permission from the Ute tribe to introduce Swoop in 1996. The eagle character also shares the same name of other eagle like characters for the NFL’s Philadelphia Eagles and some other, smaller schools. Swoop is probably the youngest mascot out there. As for the get up, Swoop sports just about all you need for a passable mascot. He’s got a big ole furry head with a giant beak and some laser read eyes. The rest of the body lacks any other fur as the full one football gear befits Swoop instead. He can do the typical 4 wheel ATV type stunts and other hi jinks. There’s nothing really controversial about Swoop but that’s just because he’s so young and hasn’t hit the mascot big time yet. Really that’s what the issue is with Swoop. Much like the rattling of swords over their football program not getting a shot at the big time, it seems like Swoop himself is still playing it out small. We all can agree that going undefeated twice in a second tier football program is mighty impressive and maybe they should get more respect. But with threatening talk of getting Washington involved and then tossing down a half put together playoff suggestion, the Utah Utes through the Mountain West Conference show that they are still a small time program. Is there blame for Utah and Swoop? To get a seat at the table you gotta make some noise. Rattling the bird cages seem like a last resort for Utah and the Mountain West. The choices they are making in recent memory are doing more damage. They had the sympathy vote, but now it’s turned into toadie like spite. A focus on a more positive campaign for football respect must happen soon to win us back. Swoop has a head start. 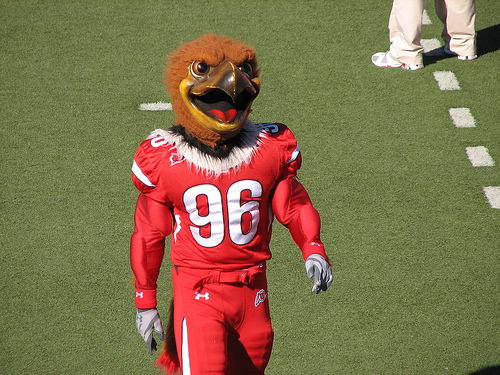 The University of Utah Utes and they’re mascot Swoop are immature in the minds of the football stalwarts. There’s opportunity to mend bridges they are burning. Swoops young history gives him room to establish himself among the mascot elite. He’s a pretty vanilla guy in ultimatley a pretty vanilla part of the country. Now we’re just waiting for some real mascot rumblings from this little hatchling.